Montana held a 49-48 lead with 3 minutes, 20 seconds to play on Saturday night before UC Irvine closed the game on a 12-2 run to defeat the Grizzlies, 60-51, at the Bren Events Center. The contest was hotly contested throughout, with neither team leading by more than a single possession for 18 consecutive minutes. That changed when Michael Oguinehit a clutch three-pointer to extend the Grizzlies’ second-half run to 9-2 and give Montana a six-point lead (35-29 with 15:10 to play). Montana would lead by as many as six points multiple times in the second half and didn’t relinquish its lead until a cold stretch gave the Anteaters a 41-39 advantage with 7:09 to play. An Oguine free throw with just over 3 minutes to play put the Grizzlies on top once again, but UC Irvine scored the game’s next 10 points to put the game out of reach. Montana never trailed by more than three points until the final 85 seconds of the contest. Head coach Travis DeCuire stated all week that rebounding would be a key factor. UC Irvine ranks in the top 15 percent of the nation for rebounding, but Montana out-rebounded the home team, 20-11, in the first half. That changed in the second half, as UC Irvine totaled 24 boards (to Montana’s 13), including a 12-3 advantage on the offensive glass. After missing the past six games with a wrist injury, senior forward Jamar Akoh made his return to the lineup, earning the start and playing 28 minutes. He finished the night with six points and eight rebounds. Freshman Ben Carter saw his first action against a Division-I opponent, totaling 10 minutes down low, also scoring two points, two rebounds and one steal. 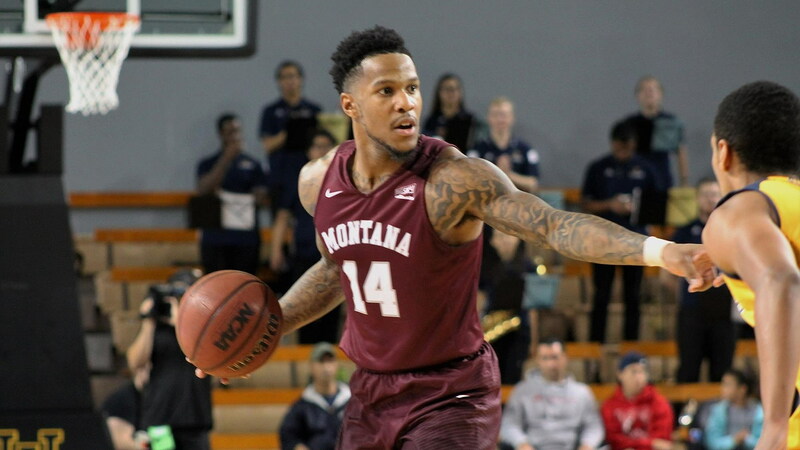 Oguine led the Griz with 16 points and three steals. Sayeed Pridgett had 13 points and three steals. Bobby Moorehead had a career-high three blocked shots, while Pridgett played 37 minutes, one shy of his career high. The Grizzlies led for more than 21 minutes, compared to just 12:43 for UC Irvine. Montana was held to season lows for points and field-goal percentage (36.0) and turned the ball over a season-high 18 times. Montana opened the game on a 10-0 run, holding the Anteaters without a point for the first 5:50 (0-for-6 shooting). Montana opened the game 4-of-8 from three-point range, before going just 2-of-14 after. After leading by six, 39-33, with 11:15 to play, Montana missed six consecutive shots, allowing the Anteaters to go on an 8-0 run and regain the lead. Montana’s game plan was altered down the stretch due to foul trouble. Akoh picked up his fourth foul with 12 minutes to play. Carter, Oguine and Pridgett also had four fouls, while Timmy Falls and Ahmaad Rorie finished with three. Montana will have nine days until its next game, a home contest vs. North Dakota State (Dec. 17).